START HERE – GET THERE!! 5. To take Continuing Education classes just for self-improvement or just for fun! ACC has an excellent ASL ESOL (English for Speakers/Signers of other Languages) program that is designed for direct communication in ASL and written English. See our exciting website and video here: http://sites.austincc.edu/esol/asl/. ASL fluent Instructors who are also certified in Deaf Education teach our ASL ESOL classes. A Deaf Counselor provides advising, registration, counseling, college transfer and workforce planning assistance for all students. Free Tutoring by both Deaf and hearing tutors fluent in ASL is provided, with access to computers, webcams, and other technology. ACC’s Interpreter Services (IS) has quality Interpreters who provide full communication access for ACC students, faculty, and staff who are deaf or hard of hearing, plus we offer CART and speech-to-text captioning services as well. The ASLIT-American Sign Language and Interpreting Training program serves more than 1,250 students each year – check out their website here: http://sites.austincc.edu/aslit/. 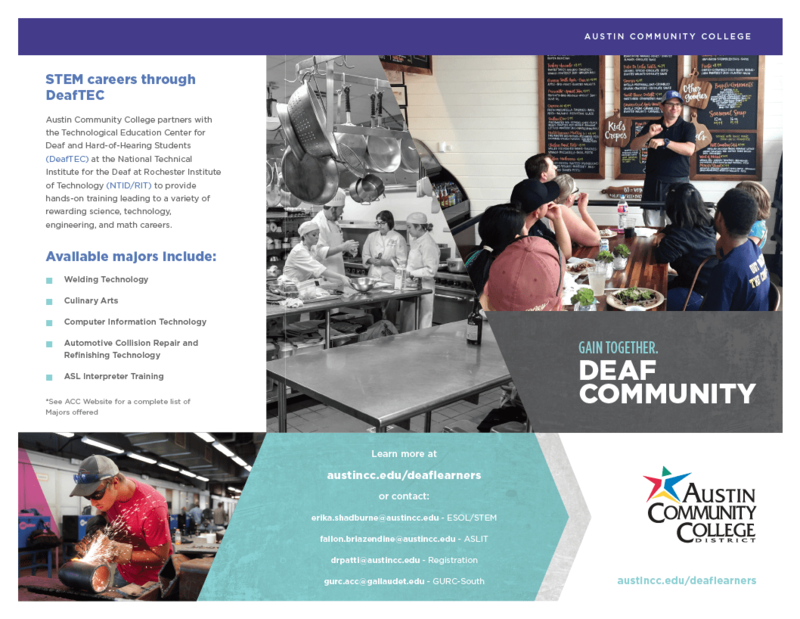 Deaf students at ACC major in virtually every field, ranging from Jewelry to Calculus, Interpreting, Automotive, Physics, Culinary Arts, Building Construction, Renewable Energy, Social Work, Radiology and Education. ACC has Articulation Agreements with NTID and Gallaudet University for transfer of college credits between schools, and the Gallaudet University Regional Center-South (GURC-S), located on the ACC-Riverside Campus http://www.austincc.edu/gurcsouth offers a 2+2 transfer program for an AAS to BA degree in Interpreting at Gallaudet University.